Heinrich Rudolph Hertz was born on February 22, 1857, in a well-to-do family in Hamburg, Germany. His parents began his education with the intention of shaping his career in architecture and engineering. But soon they realized his interest in pure science and research. He was a curious child with a habit of observing and learning about new ideas and things. Heinrich joined Berlin University, where a person of rare intelligence, versatility and multifaceted personality – Professor Hermann Von Helmholtz, taught various subjects like physiology, anatomy, physics and mathematics. On the basis of his researches in physics, he conducted research in measurement of the speed of the throbbing of arteries. He produced electromagnetic waves in the laboratory and analysed their wavelength and speed. He also conducted analysis of oscillation and speed. He also conducted analysis of oscillation and speed of sound waves, principles of rhythm in music, gave a new statement on the conservation of energy; principles of the colour spectrum, etc. Besides, he also invented the ophthalmo-scope, to check eye diseases. This equipment is used even today for observation and correct diagnosis of the eye diseases. Hertz learnt a lot under the able guidance of Helmholtz. At the same time, Helmholtz also realized that he had a very talented pupil in Hertz. Both reciprocated each other with satisfaction. 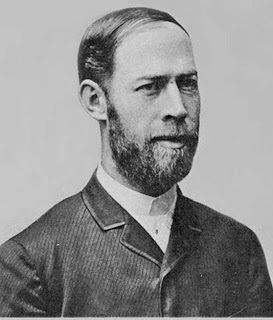 Hertz graduated in 1880 and was soon appointed as his deputy by Helmholtz in his research work in physics. In 1883, he was appointed professor of physics at Kiel in Northern Germany. 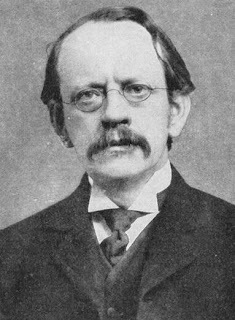 He joined it and worked on Maxwell’s electromagnetic theory. The theory of electromagnetism was first published in the form of an essay in 1865. Many of the present day advancements in science are based on this theory. Hertz’s initiation into research brought him fame and provided him a new direction in research. He now concentrated on the experimental study of implication thought out the maxwell’s mathematical equations. He wondered if electromagnetic waves could also travel like light waves. He also began to visualize on the experiments that could be conducted on the subject. Meanwhile, he joined Karlsruhe Polytechnic as professor of physics. Now he thought of conducting research on the production and propagation of electromagnetic waves. He wondered how much time it would take to propagate such waves from one place to another and how to accurately measure such a small interval of time? Heinrich constructed the world’s first radio transmitter and radio receiver for the purpose, generating radio waves. Prior to this no one had heard about it. Hertz’s equipment later laid the foundation for invention of the modern radio, radar and television. He conducted his experiments in a small 10m X 10m room. A wave traveling from one end to the other and back covered a distance of 20 meters. It was very difficult to measure the time taken by the wave to cover this distance as it was expected to be less than one microsecond. A brilliant idea struck him – a Leyden jar could be used for the pupose. A Leyden Jar (a type of capacitor) could be used as an instrument to measure time because the electric discharge that took place between two points was a very fast process. Another thought that struck him was that there could be some conductor, which could produce electric discharge. 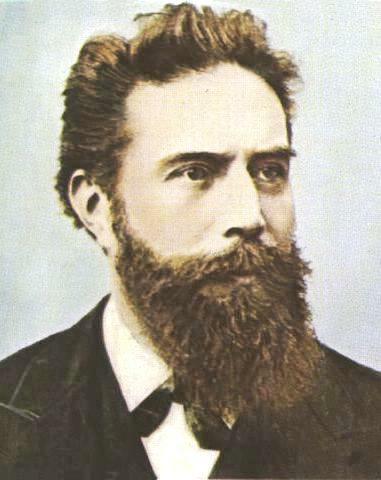 Hertz demonstrated the production and propagation of radio waves (electromagnetic waves of long wavelength). Next, he wanted to prove that however brief, a wave took specific time to another point. For this he once again returned to sound waves and dwelt on Helmholtz’s work. Waves originating from the same source but reaching destination by separated paths could either be weak or very powerful. In terms of frequently modulation one can call them constructive or destructive. As the receiver moves from one point to the other, the vibration will cease at a certain nodal point which in scientific terminology is called destructive interference. The distance between two such points is equal to half the wavelength. Hertz succeeded in measuring the wavelength of an electromagnetic radiation using the phenomenon of interference. Thereafter, Hertz studied many properties of the electromagnetic waves: like the radiations of light, these electromagnetic waves can be focused, distorted, reflected, refracted, polarized, etc. Similarly, he also measured the speed of the electromagnetic waves, which equaled the speed of light, i.e. 3 X 108 metre/second. Thus, through a series of experiments Hertz proved that the electromagnetic waves were quite similar to light waves. “My experiments have proved the solidarity of Maxwell’s doctrines.” He would say this in all modesty. In 1889, at a meeting held at Heidelberg, the Association for the advancement of Natural Sciences described and discussed Hertz’s experiments and findings. Researchers and scientists present at the meeting lauded his efforts. 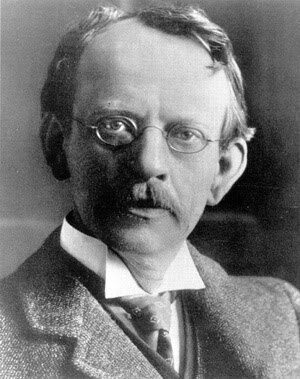 At the age of 32, Hertz was appointed professor of physics at the University of Bonn. Hertz met an untimely death, due to blood poisoning, at the age of 37 in 1894. The SI unit of frequency, the Hetz (Hz), is named after him. 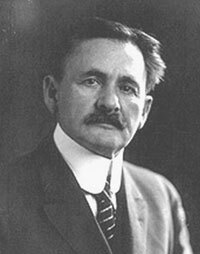 Albert Abraham Michelson was an American physicist known for his work on the measurement of the speed of light and especially for the Michelson-Morley experiment. He was the first American to win a Nobel Prize for Physics (1907). 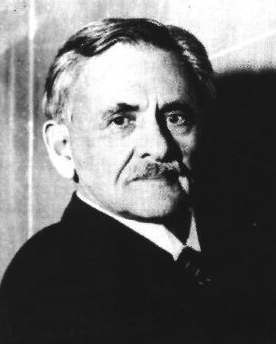 Albert Michelson was born on December 19, 1852, to a German Jewish couple in Strelno (now Strzelno), Prussia (presently in Poland). In 1848, the Liberals in Germany advocated equality in taxes and freedom of speech. But by the time of Albert’s birth it was almost clear to them that the changing political scenario would make it difficult for them to live in Germany. And they started leaving the country to safer places. Some of them came to America and among them were the Michelsons who reached New York in 1854. Albert was just two years old then. After a while, they sailed to the western shore and reached California. By 1849, California had acquired the reputation of the promised land of gold. Albert’s father, Samuel Michelson owned a small dry-fruit shop in Cleaver’s country. Albert received primary education in the local school. For high school, he was sent to San Francisco. He was a bright student. Besides mathematics and science, he was well-versed in handling mechanical devices. For his adroitness, he was given charge of the scientific equipment in the school laboratory. He was paid $ 3 per month for his work. In 1868, when Albert turned 16, his family moved to Verginia in Neveda State. Here silver mining was a major activity at that time. A year after they came here, his brother Charles was born, followed by the birth of his sister Mariam the next year. Charles went on to earn name as the publicity director of the Democratic Party during American President Franklin D Roosevelt’s regime. Albert graduated from the Naval Academy in 1873. As per Academy rules, he served in the American Navy as ‘assignee’ for two years. On completion of duty, he was called back at the academy and appointed as teacher of physics and chemistry. During this time he developed an interest in the study of light especially the various techniques to measure the speed of light, which sustained throughout his life. 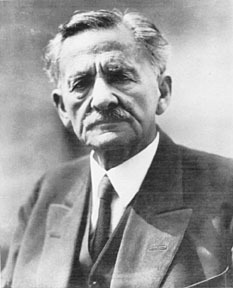 Using Foucault’s method of revolving mirrors, Michelson developed his unique technique to measure the speed of light. With some lens available in his laboratory besides spending $ 10, he developed his technique. He could accurately measure the speed of light in the vicinity of 500 feet. 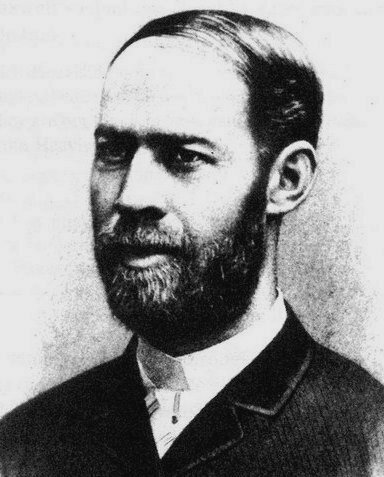 In 1878, his first research paper was published in the American Journal of Science. It was titled ‘Measuring the Velocity of Light’. Using this new technique, the speed of light was found to be 1, 86,508 miles/second. Thereafter, he concentrated on the colours seen in a soap bubble. He studied the refraction in the surface area of the bubble. He explained that if the layer of soap film has half the wavelength of light, the two waves do not interfere and hence, do not get destroyed. Sir Isaac Newton too had studied the studied the colours in bubble. But he did not believe in the arguments regarding the wavelength of light, so could not put forth any explanation for it. It was known then that if the thickness of the soap film is known the speed of light can be determined. But it was a difficult task. In 1887, Michelson designed an instrument that made him world famous. This device was called ‘Michelson’ Interferometer’. Even today in colleges’ students of physics use this device to measure the wavelength of light. Here, a partially silvered glass plate divides a light ray into two parts and two such waves coming form different directions would get refracted and interfere to form straight fringes under certain conditions, making it easier to measure the wavelength. A mystery that puzzled scientists then was whether light waves need a medium to travel like sound waves. How does light travel from the Sun to the Earth? Scientists thought of a substance called ether, but were not sure about it. Michelson and his assistant Morley performed the experiment to test the ether hypothesis. At that time Michelson was professor of physics at the school of Applied Sciences in Cleveland. 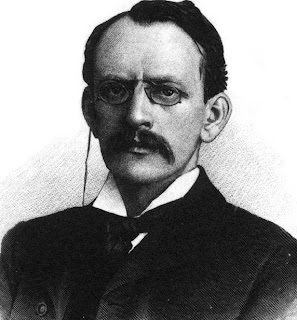 He later moved to Clarke University and in 1892 joined Chicago University as professor of physics and head of the department. Here, he could concentrate more on research, as his lectures were limited. He was a great disciplinarian. He always assessed his findings. Probably this could be the reason he could not mix freely with his students like Einstein or Fleming. But he had a tender heart and music was his only hobby. He was a good violinist and taught violin to two of his six children from two marriages. The world of science always held Michelson in high esteem. Several institutions honoured him. He was honoured with the Nobel Prize for Physics in 1907, the first American to receive the award. Eleven universities all over the world conferred on him honorary doctorates. London’s Royal Society awarded him the Rumford Medal. He was also honoured with the Grand Prize in Paris and Exposition Prize in Rome. In 1892, the International Bureau for Weights and Measurements in Paris honoured him by awarding him an honorary Membership. In 1926, Michelson performed a new experiment to measure the speed of light. In this experiment too he used Foucault’s principle of revolving mirrors. For this a special centre was set up on Mount Wilson in California. Exactly 22 miles, i.e. about 35 kms away on Mt San Antonio, another mirror was placed. Then light waves were sent from Mt Wilson. At the same time mirrors started revolving. The light wave traveled to Mt San Antonio, got reflected from the revolving mirrors and returned to Mt Wilson. During this period the mirror had completed a sixth of its revolution. Thus, he once again proved his technique to measure the speed of light. Michelson worked till his last breath. 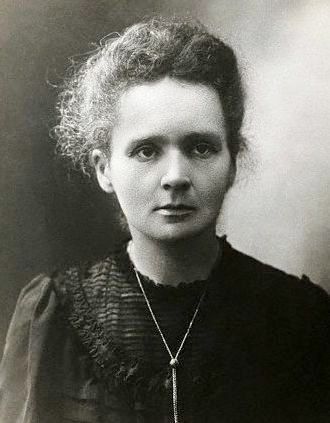 This great scientist died due to brain hemorrhage at the age of 79 on May 9, 1931. Wilhelm Konrad Roentgen, the man who discovered X-rays, was born on March 27, 1845 in Lennep, in the state of Prussia. His father was a German farmer and his mother was Dutch. He took primary education in Holland and for university education he went to Zurich University, Switzerland. Here, he had the opportunity to work under the famous scientist, Rudolf Clausius. Roentgen’s favourite subjects were electricity, energy, light and elasticity. After receiving his doctorate in physics, he was appointed assistant professor at Wurzburg. 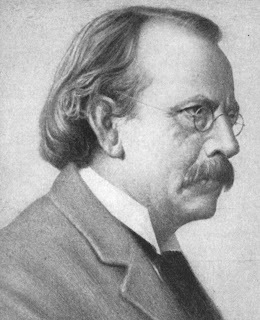 He also taught at other universities in Germany and then returned to Wurzburg in 1885 as professor of physics. Here, along with teaching, he got an opportunity to do research work. He studied the effects of electricity when passed through a gas at a low pressure in a Crookes tube. He carried forward the incomplete work of British scientists Michael Faraday and William Crookes. Faraday had studied the effects of electricity when passed through solid, liquid and gas. 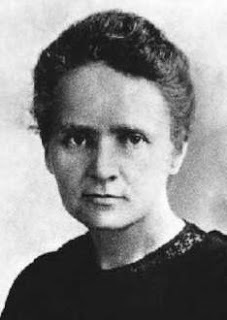 Crookes had fixed two electrodes to both ends of a gas, discharge tube and then passed a high voltage electric current through it. Now, Roentgen had better equipment to produce high vacuum in the tube. Besides, he had a good assistant too, who was an expert glass blower. He would heat the glass tubes and produce desired shapes out of them. He prepared a tube with two electrodes and created near vacuum in the tube. He connected both the electrodes to a high voltage supply. He noticed that rays were produced near the negative electrode. Further study of the rays revealed that they could produce a shadow of the object kept in their path. They even forced a paddled plate to rotate that was kept in their way. When they hit glass they produced green coloured flourescence or glow. These rays, called cathode rays, were deflected by electric and magnetic fields. Crookes’ cathode rays consisted a stream of electrons. Roentgen tried to further Crookes work from here. He covered the Crookes tube with a thick cloth. In a Crookes tube, the cathode rays traveled from the negative electrode to the positive electrode or anode. He inserted a blade of tungsten as a target between the anode and cathode. When the cathode rays in the tube were deflected after hitting the target, they came through glass and produced images on the photographic plate placed nearby. Roentgen thought that these rays were different from the cathode rays obtained by Crookes, as cathode rays could not pass through glass. Roentgen named these unknown rays ‘’X-rays’ His friends and associates called them Roentgen rays, but later they came to be better known as X-rays. He studied these rays more closely and discovered that even through the photographic plate was wrapped in black paper; the X-rays penetrated it producing the image of the palm on the photo-film. He concluded that these X-rays had the power to penetrate the flesh of a living being. However, they were unable to penetrate the bones as was proved by the image of the palm. When Roentgen announced his invention and demonstrated it in the assembly of Wurzburg Medical and physical society in December, 1985, experts present in the assembly immediately realized the importance of X-rays in medicine and other fields. It surprised many that Roentgen’s X-rays could penetrate the human flesh. To celebrate Roentgen’s discovery, a dinner and dance party was organized. Many women stayed away from the party, lest the X-rays showed them without clothes in the party. Gradually, with the spread of information about X-rays, people realized their utility. The misunderstanding regarding the rays also vanished. For his discovery, the Royal Society honored him by awarding him the Rumsford award in 1896. Roentgen was awarded the Nobel Prize for Physics in 1901, which was introduced in the same year. Today, X-ray has become extremely useful in detecting fracture in bones, Surgery, etc. They are equally useful in the study of the internal structure of metals and other scientific researches. 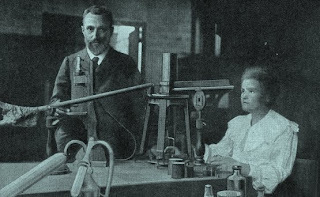 X-rays were discovered by the end of 1895 and soon followed the discovery of radioactivity by Becquerel and many other important discoveries by some of the greatest scientists like the Curie couple, Rutherford, Planck, Einstein, Fermi, etc. 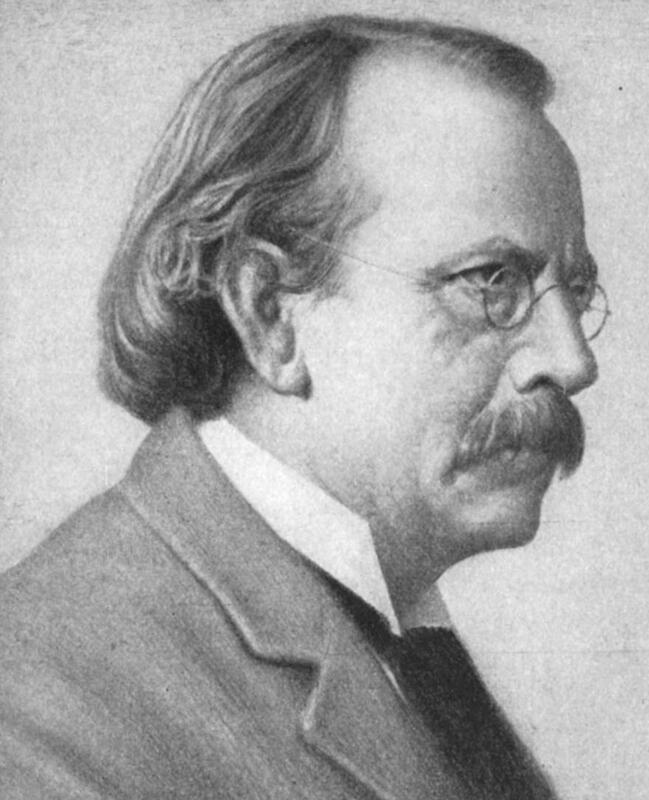 Following his important discovery in 1895, he was appointed professor of physics and Munich University in 1900. He worked there till he turned 75 in 1920. He died at the age of 78 in 1923. 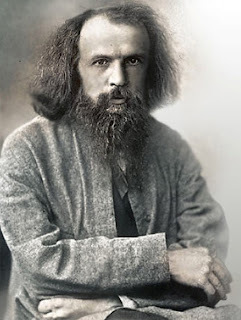 Dmitri Ivanovich Mendeleev was a Russian Chemist & inventor. He is credited as being the creator of the first version of the periodic table of elements. Using the table, he predicted the properties of elements yet to be discovered. He was born on February, 1834 at Tobolsk in Siberia, in the eastern part of Russia. The Cazar was then ruling over Russia. His father was a director of the local school. Dmitri was the fourteenth and the youngest of the siblings. Theirs was one of the leading families of Tobolsk. 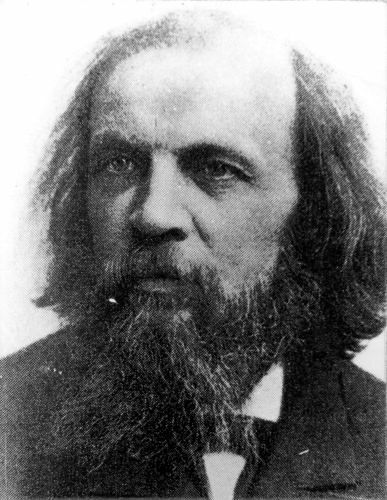 In 1787, Mendeleev’s grandfather has set up a printing press. His mother belonged to the Tatar’s and was known for her beauty. Her family was also the first to start the glass-manufacturing factory. Immediately after his birth, his father lost eyesight and so also his job. But his mother was very clever and did not lose her spirit. She restarted the closed glass factory belonging to her parents. This partly helped them financially. The political prisoners of Russia then were deported to Siberia to spend their long sentences. One of Dmitri’s sisters married a revolutionary of the December 1825 revolution. He was educated and was sent out of Tobolsk. After sometime, the glass factory was destroyed in a fire and finally it had to be closed. Learning of Dmitri’s thirst for education and his intelligence, his mother decided to continue his studies. Siberia then, had no reputed educational institutions. She then decided to shift the family to Moscow. Arriving in Moscow was an eye opener and here, he experienced difficulties that one faced in life. Not knowing Russian and speaking only Siberian, he was denied admission in Moscow University. He was 17 years when his determined mother moved the family to St. Petersburg. First thing she did was to teach Russian language to her son. Then she enrolled Dmitri in a Teacher’s training school where he learned physics, chemistry and mathematics. Though knowing only one language, he stood first at the graduation examination. Dmitri’s health was not as good as it was earlier. He had problem with his lungs. Loss of his mother then completely broke his heart. The doctors expressed their fears that Dmitri would not last beyond six months. He then shifted southwards to Crimea having dry climate. He got a job of a science teacher. But in a short while, war broke out. Dmitri had to shift to Odessa and then to St. Petersburg. He tutored some students at home during his spare time and earned some money doing so. During this period there was no avenue for progress in Russia especially in the field of science as there were no facilities for research. One had to seek permission of the authorities to study abroad. 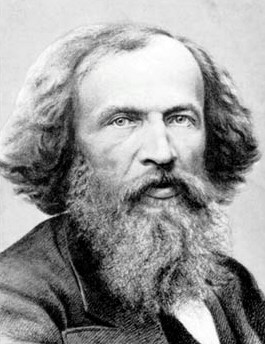 Mendeleev sought permission for studying at France and Germany. He reached Paris and got a job as an assistant to experimental chemist Henri Regnault. A little later, he established his small laboratory to conduct research at Heidelberg. Here, he came in contact and worked with Robert Bunsen, the inventor of the famous Bunsen burner, and another famous scientist Gustav Kirchhoff. The three got together to construct spectroscope. Spectroscope is used in analyzing light. It is also extremely useful in the study of analysis of chemicals. He attended the local Science congress in Germany. 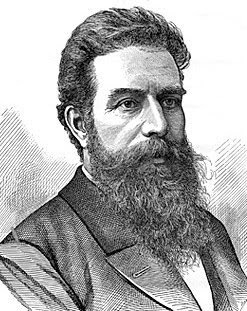 He was fortunate to hear the famous appeal of Stanislao Cannizzaro in favour of Avogadro’s work. Later, he utilized the atomic and molecular mass table of Cannizzaro. As a result, Periodic Table of all elements was constructed in the period 1868-69. This was the greatest contribution of Mendeleev- the Periodic Table of Elements. He got inspiration from here to construct the Periodic Table. After completing study tour of France and Germany he retuned to St. Petersburg. Finding a suitable match, he married only to divorce and settled down after remarriage. He also wrote a research paper on ‘Carbonic Chemical Studies’ in 60 days. Meanwhile, he wrote a thesis on water and alcohol mixture, which got him PhD. In 1865, when he was just 31, in recognition of his immense contribution and service to the progress of science, he was appointed the professor of chemistry at the Petersburg University. Attractive personality and a unique thirst for research led many students to seek inspiration from this young professor. His classes were always well attended. Scientists were then aware of only 63 elements. It was Mendeleev who gave the Periodic Table, his invaluable contribution. Due to its unique and useful layout, all elements were arranged according to their chemical composition and nature. All 63 elements were arranged according to their atomic weight. The first was the lightest element hydrogen and uranium was the last, being the heaviest in element then. He constructed the periodic table with elements set in seven groups according to regularity in physical and chemical characteristic properties of elements. Then, Mendeleev concentrated on the gaps in the Periodic Table. He began searching for new elements missing in the periodic Table. He even predicted several of the along with their atomic weights. Among such elements were silicon, gallium, germanium and scandium that were discovered much later. The chemical characteristics predicted by Mendeleev matched exactly with those of the elements discovered later. This periodic table was regularly reviewed. Today, the elements are arranged according to their atomic number. Atomic number stands for the number of protons in the nucleus of an atom of the element. Atomic number of an element is nearly equal to the atomic weight or mass of the element expressed in grams. 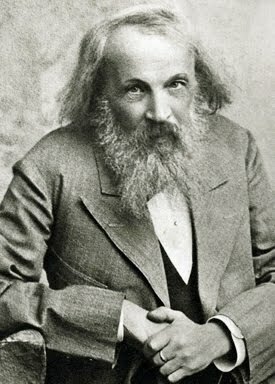 Mendeleev died in 1907 at the age of 73 suffering from pneumonia. When he was only 21, doctors had warned that he would not survive beyond six months. But fate had other designs for him. At the time of his death, the number of elements in the periodic table had grown from 63 to 86. There are 92 natural elements. Apart from these elements, scientists have produced some new elements using nuclear reactions. The new element with atomic number has been named mendelevium after him. Henry Cavendish was a British scientist & well known for the discovery of hydrogen. He was born in Nice in France on October 10, 1731. He was the son of Lord Charles Cavendish & Lady Anne Grey. He was a rich man in his time. But his lifestyle and dressing remained that of a common man. He wore mended clothes and worn out shoes. He was a happy, carefree and reserved person. In the 14th century, his grandfather and great grandmother held important positions. He was a nobleman from an aristocratic family. His ancestors included a Lord and a Chief Justice. His ancestor Thomas Cavendish was a great adventurer. He had sailed around the world with his flotilla of ships. Thus, the entire family of Henry held a leading position in the country. Henry was elder and Fredrick, the younger of the two sons of Lord Charles and Lady N Cavendish. His mother died when Fredrick was born while Henry was just two years old. Henry’s father was a well-known scientist and a Fellow of the Royal Society of London. He invented the minimum and maximum temperature thermometers. For his invention he received the prestigious Copley Medal from the Royal Society. In 1742, at the age of 11, Henry was admitted to the boarding school at Hackney. He then studied for four years (1749 – 53) at Peter House College, Cambridge. Religion, religious teaching and religious groups never interested him. But it was compulsory to take up religious study to obtain a graduate degree. Therefore, he left the university without a degree. Henry and Fredrick stayed in London for some time. They moved to Paris to study physics and mathematics. During their study they received a limited, but sufficient pocket money. When Henry Cavendish was 40, his father died leaving him a fortune as inheritance. Since then he never felt dearth of money. He received good education and his economic condition too, was fine. He felt uncomfortable in the company of women and was also called misogynist. Even for the maidservants he left written instructions. He had few friends. Besides, he spoke very little. He spent little time in activities other than that related to science. He would ask his banker / inventors to take their own decision rather than consult him. He lived detached from this world, his only link being the Royal Society of London. In 1760, at the age of 29, he was appointed the Fellow of the Royal Society. Now, he regularly visited the Fellow club to have food. At that time, science had yet to reveal the mystery of fire, its significance and its safety. Two German scientists John Bayer and his student George Ernest Stahl had given some insight on fire. Though it was generally accepted it had some inherent flaws. Priestley, the discoverer of oxygen, too, at that time accepted Bayer’s conclusions regarding fire. According to Flogisten’s theory, all inflammable substance contains at least two elements: the ash of the substance and the inflammable element Flogisten. When a substance burns, the inflammable element is release. When this element stops coming out, the fire is extinguished. Till now, nobody had tried to analyse Flogisten. Cavendish decided to take up the challenge. 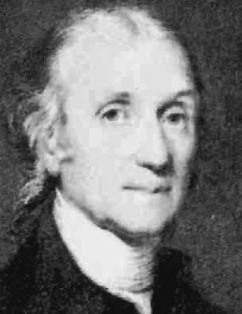 Henry Cavendish studied the subject extensively in the library. Meanwhile, he learnt that Parcelsus and Yan Von Helmont had discovered an inflammable gas. For this they had placed some iron pieces in sulphuric acid. Some bubbles surfaced on the iron pieces. The gas produced through this process was inflammable. They did not work any further on this subject. Cavendish thought that this inflammable gas might be Flogiten. He had set up a small laboratory in his house. He collected some iron, lead and tin pieces, besides hydrochloric acid. He then put an equal number of iron pieces in both acids. He did the same with the lead and tin piece producing hydrogen. As a result of the chemical process some bubbles surfaced. He collected the gas bubbles in separate balloons. He noticed that all the balloons contained samples of inflammable gases and they all produced similar blue flame. On further observation he found that the gases weighed the same and the volume of inflammable gas produced was proportionate to the metal pieces. He concluded that he had succeeded in separating Flogisten. He announced his findings at a meeting of intellectuals of the Royal Society in 1766. Nobody doubted the veracity of his research. Today, it might seem odd how intellectuals of that time accepted the gas as Flogisten. Cavendish was no doubt a genius. But some time later, French scientist Lavoiseier rejected Cavendish’s theory about Flogisten and declared that the combustible has was not Flogisten but hydrogen. The discovery of hydrogen created sensation among scientists and the public. The fact that hydrogen was lightweight and inflammable and could be produced easily at home attracted the attention of many. As a result, many accidents occurred and some people lost their lives too. Mixture of hydrogen and oxygen can result in an explosion. 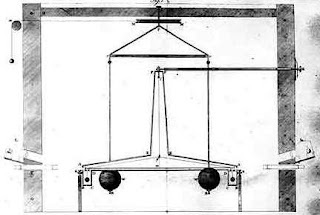 In 1783, a hydrogen-filled balloon was flown. Earlier, in 1781, an Italian based in England had publicly demonstrated that hydrogen filled soap bubbles would move upwards. Even before this, a balloon prepared from cloth with paper lining was filled with hot air and flown. A French scientist Jacques Charlie had successfully flown a hydrogen-filled balloon to some height and distance. Of course, no humans traveled in it. When this balloon landed 15 miles away in a farm, the frightened farmers destroyed it. In 1775, a hydrogen-filled balloon carrying humans was flown. But it had suddenly burst killing all the travelers. This incident put a full stop to this activity, until a gigantic balloon was flown in Hindenburg, Germany, and a century and half later, in 1937. It crossed the Atlantic Ocean many a time. During one such flight with 36 passengers, the balloon filled with 90 lakh cubic feet hydrogen, burst while it cleared the sea and was passing through Lake Hurst area in New Jersey. All the passengers died in the accident. 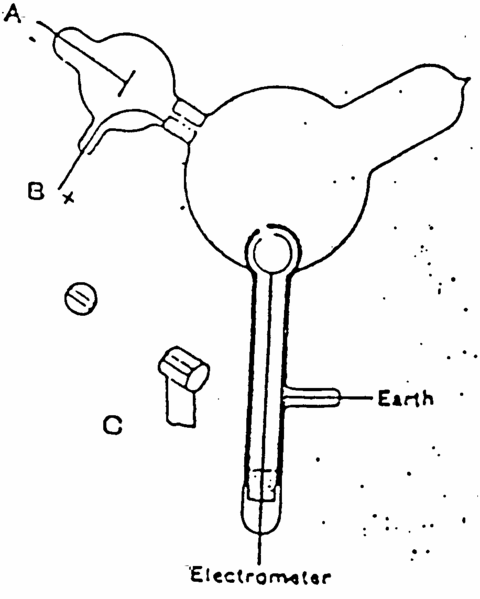 The simple arrangement used by Henry Cavendish in which an electric spark is passed through the mixture of oxygen and nitrogen placed in a tube resulting in their blending. The Royal Society and noted such incidents in which dew was formed with the burning of hydrogen. 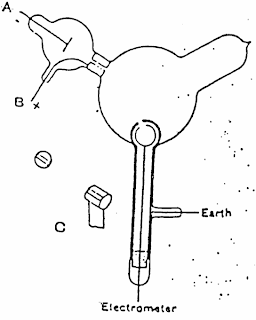 Priestley had described the blast produced by the fusion of hydrogen and air in a glass jar. In 1784, after many experiments, Cavendish had announced that when oxygen and hydrogen combined, it produced water. Thus, he established that water is not an element but a combination of two colorless gases. Cavendish announced his ‘Experiments on Air’ at the Royal Society. He also said that the air we breathe contains 20 per cent oxygen. He concluded that when there is a spark in the atmosphere, there is a synthesis of oxygen and nitrogen. Thus, lightning in the sky brings together oxygen and nitrogen. Cavendish lived a lonely life and in 1810, at the time of his death when he was 79, there was no one around to take death when he was 79, there was anyone around to take his care. His funeral was carried out at Derby in England. The local church also set up a memorial in his name. The man who never believed in sect or religion had a memorial in his name. In his will he had declared his entire wealth in his cousin’s name. One who spent his entire life in pursing science, Cavendish did not leave any money for the development of science. But his inheritor set up a chain of Cavendish laboratories to show his indebtedness to science. 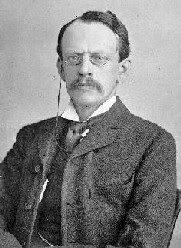 In 1897, the great scientist J J Thomson discovered the electron at one of the Laboratories. The laboratories also produced many Nobel laureates. 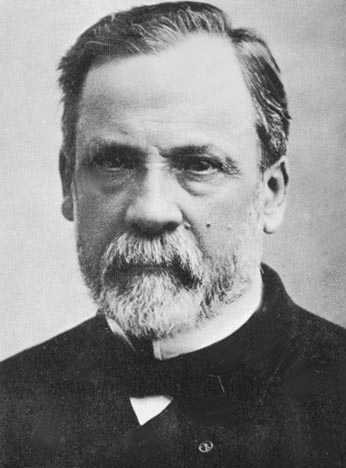 Louis Pasteur was a French chemist and biologist. He is renowned for his remarkable breakthroughs in the causes and preventions of diseases. His discoveries reduced mortality from puerperal fever, and he created the first vaccine for rabies and anthrax. He was born on December 27, 1822 in the town of Dole in Eastern France. His father was in the army. After defeat of Napoleon’s army, he returned to dole. He opened a tannery there. After the birth of Louis the family moved to Arbois in the grapes growing region. His father Jean Joseph was very strong and hardworking. Even though he had not attended any school, he had high regards for educated and intelligent persons. He had great ambition of educating his son. He wished his son to study and become a teacher. Louis was admitted to the local village primary school. He was an average student. During that time, whenever any one suffered from rabid dog bite, he was taken to an ironsmith. The ironsmith would heat a rod till it become red hot. It was the inserted in the wound where the rabid dog had bit. If the person was lucky, he would survive or else would die. Louis had seen this treatment since he was nine year of age. His heart would sink at the sight of it. He always felt like finding an alternative treatment. Louis father knew two famous personalities of the village-one a doctor and the other, a historian, D more. Louis father and D More inspired patriotism in him. 15 year old Louis was attracted to line drawing hobby. He was quite successful at it. Some of his drawing were later framed and hung at the Pasteur institute. A local secondary school teacher had noted Pasteur’s ability and predicted that he would become a good teacher. Meanwhile, Pasteur got admission in the science department of the local institute for training teachers. But he did not join the institute, as he was not mentally prepared. During this period, he took keen interest in physics, chemistry and mathematics. Pasteur wanted to be a good teacher. When he excelled in his class at the preliminaries in physics and chemistry, he felt very happy. He took up research work rather than taking up a teaching career. Pasteur went to the Ecole Normale Superiure, a university in Paris where he studied crystals. Pasteur had then heard lectures on chemistry by the famous chemical researcher and discoverer of bromine, Antoine J Balard. Like Benjamin Franklin, Balard also believed that scientific research could be carried out in a small laboratory; Balard had set up a laboratory for this purpose. When he saw Pasteur, he was impressed by him. He invited Pasteur to assist him at his laboratory. 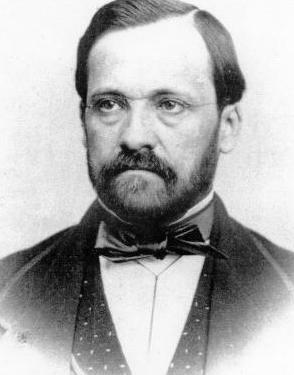 Pasteur happily took up the invitation and joined Balard in his research work. Here he could continue the research finding of Pasteur to Jeane Baptiste Biot, the famous French physicist. He checked the papers and sent them to the French science academy for further evaluation. In 1848, Pasteur was appointed teacher at the secondary school at Dijon in face of strong apposition from Balard and Professor Biot. Pasteur’s friends and well wishers stepped up pressure on the education ministry. Due to this, Pasteur was appointed as the working professor at Chemistry Department of the Strasbourg University. At the age of 26 years in the year 1849, he married Marie Laurent, the 22 year old daughter of the university rector. Marie was a good wife as well as a very good co-worker in his research work. Pasteur’s preliminary experiments were on the crystals. His study clearly identified two types of optically active crystals- producing equal and opposite rotation of polarized light. His other important study was about fermentation or food getting sour and having bad smell. This process is due to microorganisms which he clarified. This process is very useful sometimes, while at other times, it spoils and turns to waste the food products. Due to this discovery of Pasteur, the winemakers of France who manufactured wine from grapes were immensely benefited. After extensive study he discovered that microorganisms are responsible for the fermentation process. It is possible to control this process in order to obtain an appropriate resultant benefit from the same. The second result of this study was of ensuring milk remaining fresh for longer duration by a process now called Pasteurisation. This required milk to be heated to called Pasteurisation. This required milk to be heated to a certain temperature and then cooling it, in order to kill the harmful bacteria. Pasteur was honoured for his work and is known as the ‘Father of Pasteurisation’. Diesease that had entered in the rearing stage of the silkworms affected the production of silk in France. Pasteur undertook study and helped eliminate the same thus saving the industry from destruction. He identified the microscopic organisms responsible for the spreading of diseases caused by microorganisms. The bite of a rabid dog and the disease rabies caused due to it was extensively studied by Pasteur and he finally invented a vaccine for its cure. Known as cure for hydrophobia, a significant achievement then, got him name and fame throughout the world. He had to face tremendous difficulties and misfortune in his personal life. Jenny, his first daughter died at an early age of 9 years. Again in 1865, his 2-year-old daughter Camilla died after a short illness. In 1866, his 12 year-old son sybil died of typhoid. When France and Germany was at war in 1871, his son Jeane Baptiste of 20, was declared lost during the action. 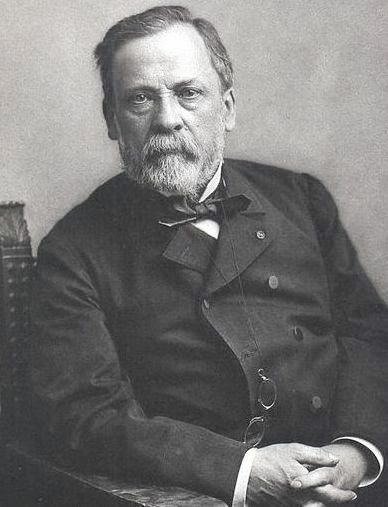 Pasteur left all his works and went out in search of his lost son. Finally, by God’s grace, Baptiste returned home with injury. He started recovering slowly. Pasteur was very angry with the Germans. Years later the German government wanted to honour him by presenting him a medal for his achievements. Pasteur however, did not accept it. On September 28, 1895, Louis Pasteur died leaving the world with memories of his great achievements like the Anti-Rabies vaccine, Pasteurisation and the path that he found to eliminate diseases.